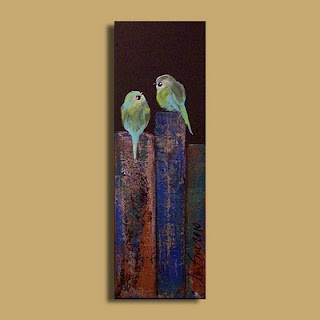 For Christmas DH gave me this beautiful painting of two love birds atop a row of books. Isn't it just wonderful? It's titled "Well Versed Love" (possibly my favorite part) and I fell in love with it the moment I opened it Christmas morning. A new Christmas painting from my sweetheart is fast becoming a tradition it seems, as you may remember he gave me this gorgeous one last year. It's currently hanging above the piano in my library and I'm trying to decide which wall I'm going to hang this new one on. Clearly it, too, belongs in the library. I'm pleased as punch with this new tradition, particularly as he has such good taste in art and knows just what I'll love. Apparently he spent hours browsing Etsy leading up to the holiday as a few other lovely items from that wonderful site ended up under my tree as well. That's my boy . . .
Oh, I LOVE it! He does have good taste. I need to start scouring Etsy for art. Oh, that is gorgeous- good job DH! What a lovely gift. It's absolutely gorgeous. I just finished the recap of my favorite reads of the year (a new tradition, I've decided), and I'd like to invite you to pop on over again if you are interested. It's lovely. I'd say he's a keeper! Absolutely a keeper! That's awesome all around. That is so gorgeous. Love it!! I want something like that. Both the painting and the husband. Good one, dude! Even though this subject has been written to death…what you have written provides a complete fresh insight. I have just no words to express now. Thank you.